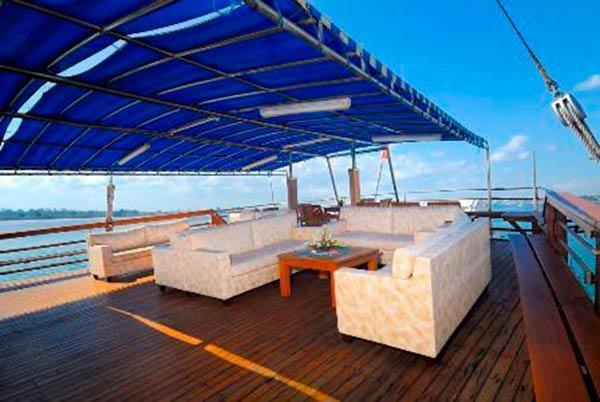 Sea Safari VII is a liveaboard diving yacht that has the best of everything. While it has the appearance of a classic schooner, it is in fact quite new – built in 2001. Therefore, the lucky guests who join its cruises can have the comforts & safety features of a modern purpose-built diving ship, while enjoying the classic charm and ambience of a boat that looks similar to those that have been sailing these waters for hundreds of years. 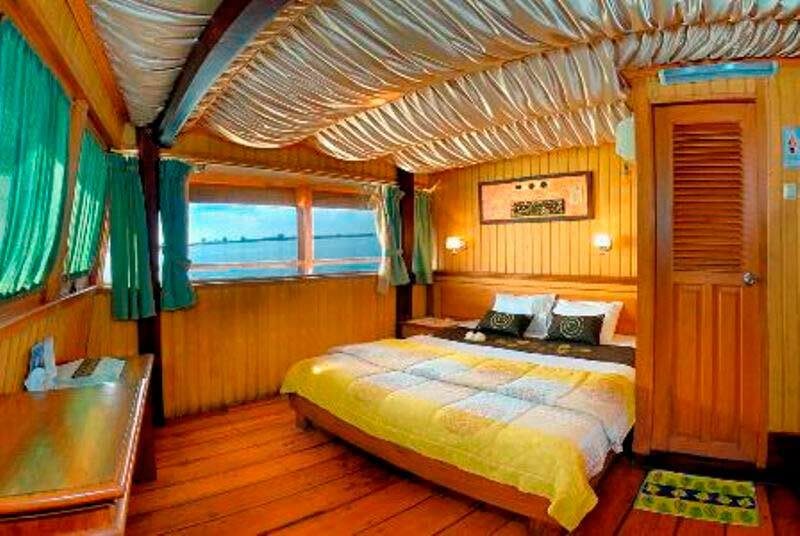 At nearly 38m x 11m, Sea Safari VII is a large Phinisi yacht built in southern Sulawesi, using Ulin wood (ironwood) by skilled boat builders. 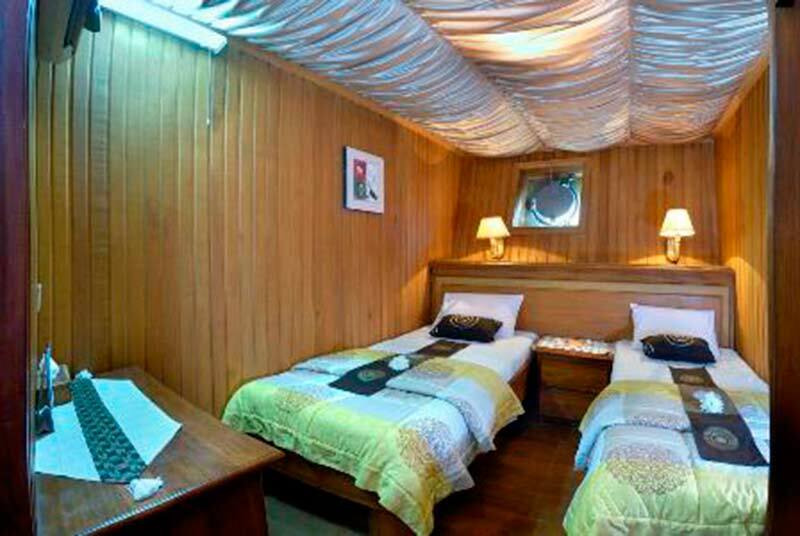 Its size allows for lots of communal areas to relax, socialize, dine & drink, as well as 14 cabins which are larger than on many other liveaboard boats in the area. 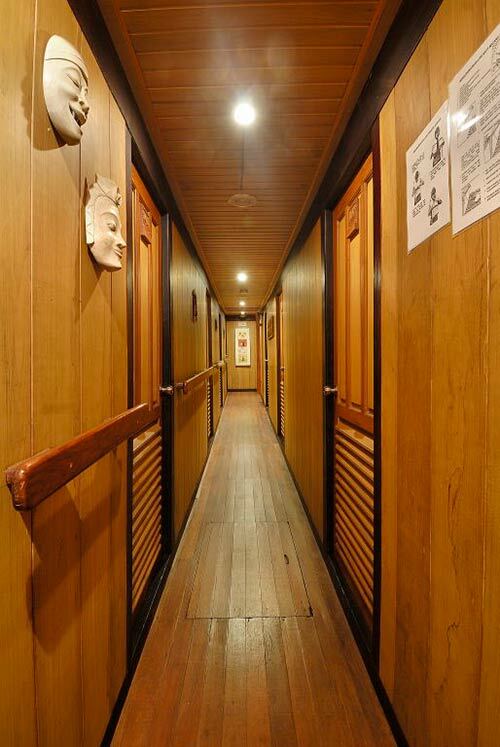 All of the cabins have individual air conditioning and en suite bathrooms with hot & cold freshwater showers. The boat has three decks plus its sundeck on the roof. The sails enable Sea Safari VII to cruise on the wind, but most journeys are propelled by its huge twin engines, which can enable the boat to reach dive sites quickly. There are three tender dinghies and a helpful crew of local and western staff. Safety and communication are always the first priority for Sea Safari vessels, but friendliness, comfort and fun are important, too. 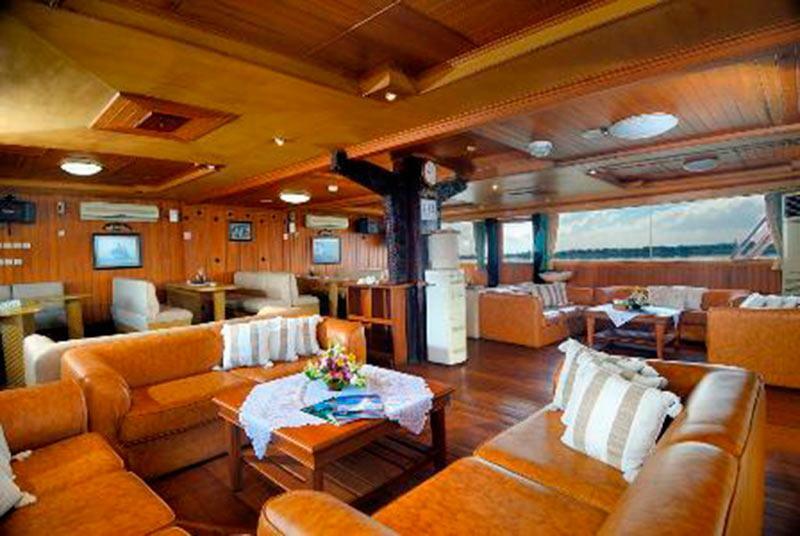 The saloon/lounge is so big it takes up most of the upper deck, and has lots of large and comfortable sofas, two lcd televisions, and benches for dealing with photo & video equipment. The bar is an area of sofas outside on the upper deck. 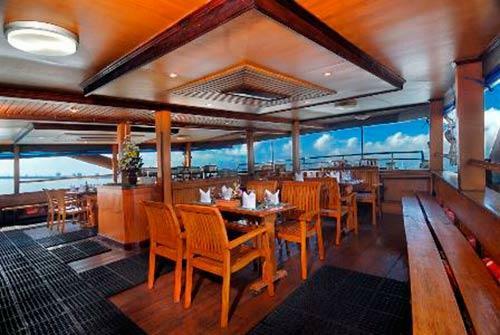 The restaurant is outside on the middle deck, to let guests enjoy the sea air during meals. 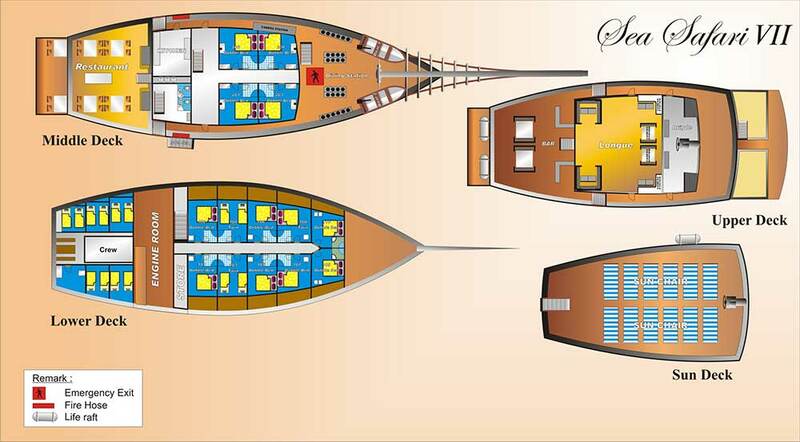 Also on the middle deck are the four largest and best cabins on the boat. The lower deck is where there are ten more cabins; 6x double & 4x twins. 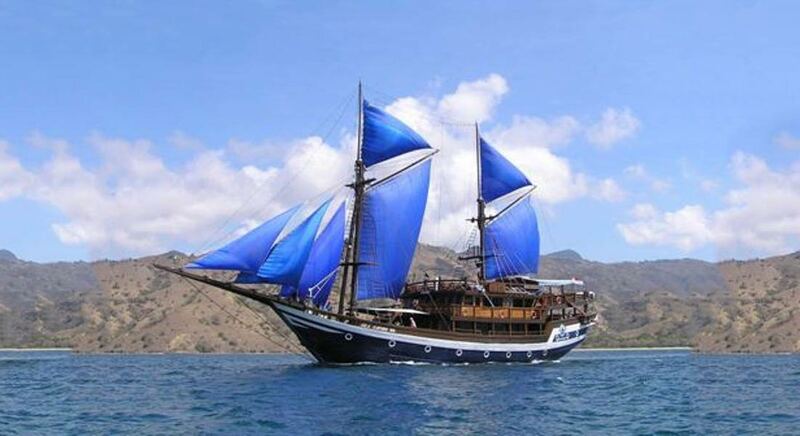 Divers on Sea Safari VII enjoy cruises of varying lengths, and always around the Bali and/or Komodo areas. 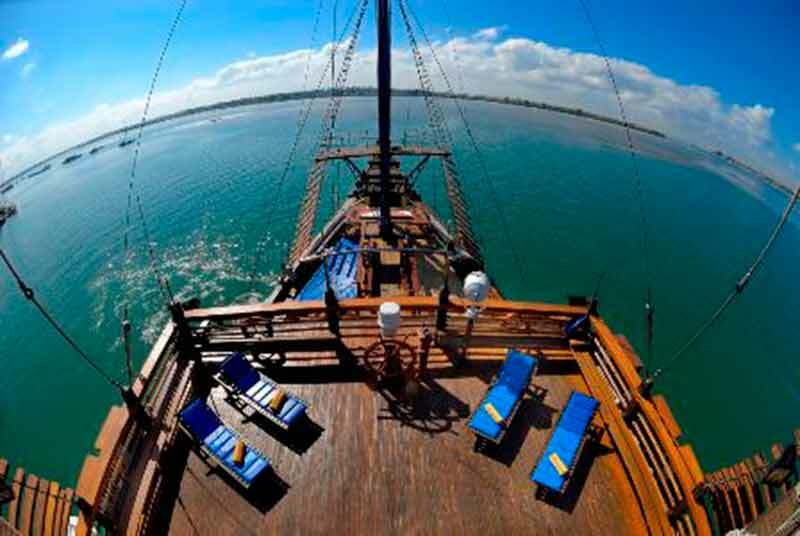 To save confusion, every cruise departs from and returns to Benoa Harbour in Bali. The itineraries below are the most common (best) examples of diving cruises on Sea Safari VII, but sometimes the order or locations of the dives are changed. Sometimes the departure orreturn ports are different from Benoa Harbour, Bali. Please check on the schedule for the trip you are interested in. If you would like to take part in a diving course during your Sea Safari VII cruise, please let us know well in advance. Although there are diving professionals on board and lots of opportunities, most of the guests are already certified and just join for fun diving, it is sometimes possible to take part in an Advanced, Nitrox or speciality course. 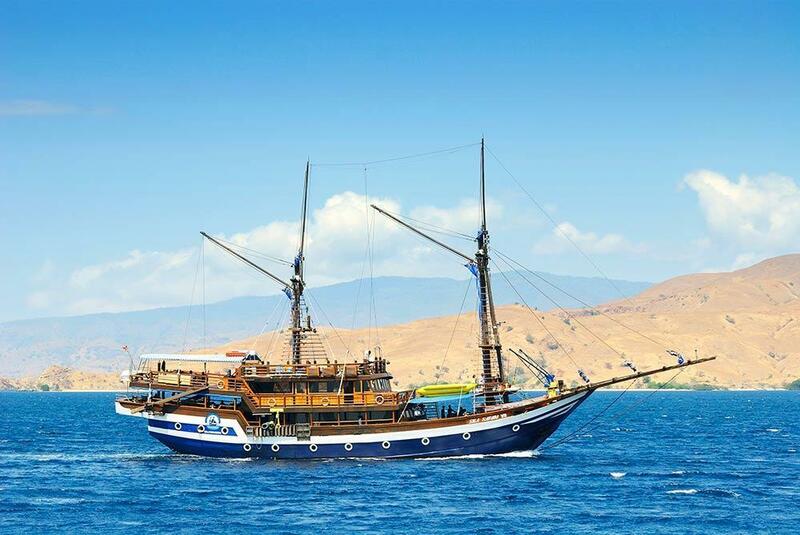 In most cases, Sea Safari VI guests are collected from local hotels, resorts and the nearest airport on the day of departure, and transferred to the boat for free. This service also applies to transfers back to hotels or the airport at the end of the cruise. We are happy to help with domestic flights within Indonesia. These can often be difficult when booked from overseas. Accident insurance, Divemaster guide services, 12-litre tanks, weightbelts & weights, land excursions harbour & Anchoring fees are also included. Domestic flights, personal insurance, visas etc. 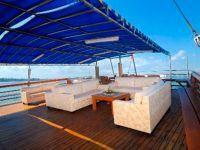 Non-diving guests are vert welcome aboard Sea Safari VII and they receive a disocunt of $50/night.